The problem is with PulseAudio plugin: the icon is too big. The row size of panel is 50 pixels; I'm using Debian Stretch. How can I uniform all icons? What version of the plugin do you have? This issue was fixed in later versions. I'm using the version 0.2.4, the latest from Debian Stable. I think that the fix won't come soon on stable branch, but at least I understood what was the problem. This morning I was thinking about a solution. There is another plugin like Pulse Audio? I didn't find anything in preinstalled plugins. Xfce also has the xfce4-mixer plugin. Thanks, I resolved the problem. I installed pnmixer, added it to Xfce session autostart programs so it is showned on Notification Area panel plugin. Why can't this be configurable? Indicator plugin keeps icons at 22px, I think. The new "status notifier plugin" has a configurable icon size, the "notification area plugin" has a configurable icon size either. I think the objective of these plugins: pulse-audio, power-manager, notification-plugin and other indicator plugins is to "blend and merge" visually with the notification/indicator areas. I hope the XFCE developers get aware of the user experience around these features. Are you volunteering to write such a thing, lol, one that will be every user's (or at least the vast majority of them) first choice for something of this nature? It strikes me that some of your complaints are about how these things appear on vertically-orientated panels. IIRC, back when such things were horizontal only, and there were requests for the ability to orient them vertically... that someone asked why there was a need for such a thing. People want different things in their distro (as they do in most all things). Yes, this reduces the possible number of developer-hours that can be spent on each one. This is something that just is. Imagine for a moment, how advanced our vehicles would be if every vehicle manufacturer on the planet worked together on (only) ONE vehicle. Now imagine how many people would lament the lack of choice when vehicle shopping (which wouldn't, after all, be shopping at that point). And, unlike the automotive industry, 99%+ of linux developers are volunteers. They're not getting paid to work for us - they're working for us for free after they clock out of the jobs that they must do to survive. And that free labor time must come out of their limited family/meal/errand/SLEEP time, too. I complain as much as anyone (and more than many ). However, every now and then... I look at the state of linux in general and my distro (/desktop environment/etc.) in particular, and I think, "Wow, this is pretty awesome - and it was all done by unpaid volunteers (along with some donations that undoubtedly averaged out to be mere pennies per hour at most)!" No, the current state of linux isn't perfect (but what is, lol?). But it's a universe better than I could do on my own. I still get annoyed from time to time, but... If the annoyance level ever gets too high for me, I have the option of switching back to one of Microsoft's operating systems - where I can pay for the privilege of being annoyed . Okay, that last part was (somewhat) facetious. But there are also commercial linux distributions; I can think of two off the top of my head, Red Hat and SUSE. Perhaps you should... invest in one of those distros for your computer(s)? I suppose that if you are willing to pay enough, you might then have a valid and reasonable expectation of getting exactly what YOU want. On the other hand, it seems that no one ever really gets everything that they desire in life, regardless of how much they are willing to pay - so why should your operating system be any different. I agree with kafran, he has a good point - the current state of the Xfce's panel notification/indicator area is not good ("messy and buggy"). Yes it works, it's functional, and this is mainly a visual issue, nothing major - but it would be great if the developers came with a better solution than 4-6 different separate plugins/areas that aren't unified. Now it could be confusing for new users (in default Xubuntu 18.04 for example - Notification Area, Notification Plugin, Indicator Plugin, Status Notifier Plugin, Power Manager Plugin, PulseAudio Plugin) and they just look bad on bigger panels (vertical and horizontal). Answering "Will indicator-plugin dies?" question - yes, probably. Xfce devs are in the process of moving its elements to other places or separate plugins, since "indicators" was mostly an Unity thing. MountainDewManiac, was that rant really necessary? No, of course not; like 99% of the things that pass through the Internet, it wasn't really necessary - or even necessary-with-no-modifiers. Should we all just stop "complaining" and giving any feedback and share our opinions? Again, of course not. Else I'd have felt bad about giving mine, above. No. You missed my point, I guess. Or are looking to provoke. But I don't suppose it (either it) matters overmuch. Try this: There are multiple ways of doing things in linux because "linux" is not one, rigid, centralized project. It's not perfect, neither in general nor in specifics - for it was created by humans. It's collectively a volunteer effort, which largely means people doing things because - hold on, this might shock you - they want to. People are free to encourage them to do things to suit by offering baksheesh. The developers, of course, are able to accept such encouragement - or not. As I understand it, many of Xfce's developers' dance cards are full for the next... while. Therefore, I wouldn't expect a great deal of other things to become priorities. Personally, I'd like to see a little more progress on the whole GTK thing (which is what I think they're focusing on). But that's just me. You might have other wants, as might others. But it really matters little what our wants are. We're like a bunch of children, all clamoring for different things - with the developers as parents, who (presumably) want what's best for us... but have their own ideas about what that happens to be. Invariably, there will be disagreements there, lol. Occasionally we get our way. But, at the end of the day, the adults make the decisions. To further that last part: Now and then, a child "grows up and joins the other adults." I probably never will; I'm old enough (and have had some TBI incidents) that my cognitive function is already in decline. But I hope you - or you, or you, or you - will one day do so. Because the adu-- err, the Xfce developers could probably use a hand. I do not unilaterally disagree with everything that he typed. I could argue importance (in regards to other issues), but that is merely an opinion. I will argue the "can't there be only ONE?" part, though. Oh, wait - I already did. than 4-6 different separate plugins/areas that aren't unified. Again, I don't see this as high on their list at the present time. 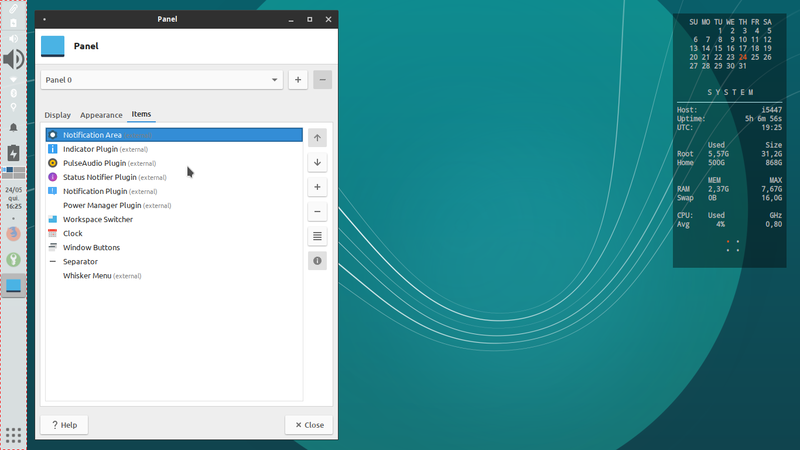 Also, (right or wrong) I see the spirit of Xfce being sort of a minimalistic thing. Not as in "four bare walls and an empty room between them," but, rather, not expending much effort on duplicating a thing when there is no real need. As an example, Xfce uses GTK - not "XTK." Many of us have had occasion to complain about some kind of GTK-related thing, I expect. But none of those complaints have caused the developers to stop what they've been doing in order to write their own toolkit. Now, with that having been stated, obviously there is some duplication within the project. Orage, for one. Mousepad, Parole, Xfburn... Thunar. Et cetera. Obviously, there was no need for any of these things - because alternates were already available. Would the core Xfce development have been further along without any of those things? That's difficult to even guess at. Some of those developer-hours might have gone into the "core" of Xfce - but some might have gone towards completely unrelated things (and then we would have lost those applications, with no real benefit to Xfce). And have a good night (or day, whichever applies). Me, I'm all ranted out (for now ). Oh, and (if it helps?) I do agree that some sort of change to the panel structure in general could be a positive change. My suggestion - and this is complete ignorance speaking, here, so there are probably significant reasons why this is not already the way it works, and why it cannot easily become the way it works - would be to treat every single thing that could possibly be placed onto a panel in Xfce the same. Do away with "indicator plugins," et cetera. A distro's update manager indicator? Stick it anywhere on the panel you like. The battery / brightness thing (that has annoyingly (IMHO - yours may differ) become ONE thing)? Ditto. Window Buttons? Likewise. Network monitor, audio controls, et cetera - regardless of which one(s) you decide to use? Guess, lol. Place them anywhere you like on a panel. Or on your second panel. Or some on each and the rest on a third. Basically, place them on the panel; not "into" some middleman thing that, in turn, gets stuck on the panel. Do away with the middleman (all possible "versions" of it). I would consider that to be a great improvement - and in line with one of the philosophies of linux (that being, user choice). But, as I mentioned, I'm ignorant of how all this stuff works, and am assuming that there are valid technical reasons why such a common sense "solution" has not become reality already. Sorry MountainDewManiac, I didn't write my previous post to provoke you. Maybe I sounded a bit too harsh. I understand what you meant and I agree with most of your points and examples. We should support the devs whenever possible. And yes, those propositions and feature/enhancement requests should also be put in places more visible for the developers, like "dev" mailing lists, IRC and Bugzilla. Some people already did that. And I know that the devs are already thinking about some small improvements in the future, so I'm really looking forward to it and I'm sure that Xfce will keep getting better. To wrap things up, I guess what I also wanted to say was that we need to find a healthy compromise between praising Linux (or its specific component, like in this case) and criticizing it. And not every user can write code and make patches, sometimes all we can do is to speak publicly what we "want" and prefer. @kafran, @spass, those are fair criticisms about Xfce. Other desktop environments are moving towards a unified notification area, so maybe Xfce should as well. It would definintely make the "notification area" cleaner and easier to manage/configure/theme. @MountainDewManaic is also correct in that this is a decision that needs to be made by the developers. It's not secret that are not too many developers currently working on Xfce and the current emphasis is on the GTK3 migration. However, the status-notifier plugin was a new addition and perhaps it is the initial move towards a more unified systray. Other than the info on that page, I haven't heard much about it. Moving this discussion over to a place where the developers are aware (mailing list, #xfce4-dev IRC channel) may be the best way to get some answers. @all, yeah, interesting discussion, but it's funny that we're having it in a "Themes & Screenshots" thread. I don't understand why this topic exploded. I had a problem, and I resolved it; there wasn't needed to criticize Xfce in this place.